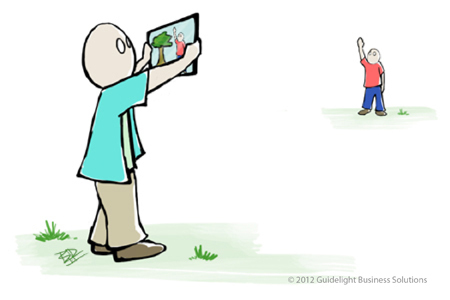 Home Blogs rauch's blog What is Augmented Reality (AR)? Augmented reality (AR) is an emerging technology based on the viewing of a real-world environment whose elements are augmented by computer-generated or computer-processed content including images, video, sounds, or even haptic feedback and smell. AR mixes these virtual elements into a live setting with the ability to support integrated real and virtual viewing, user interactivity in real-time, and 3D rendering. What Do AR Components Look Like? The core hardware components used to support augmented reality applications are a processor, a display, input devices and sensors. The fact that most mobile devices contain a CPU, a display, a camera and sensors including an accelerometer, a compass, and GPS make them perfect for delivering high levels of AR functionality. Today, many organizations are beginning to lean on these mobile devices to deliver enriched experiences to everyone from shoppers both in-store and at home, to tourists, to students, to anyone simply looking for the best food discount within their line of sight. The leading edge of the consumer market is creating applications for the iPad and other tablets since their larger screen sizes allow for increased levels of data and detail. Many of tomorrows solutions will be based on content delivered via glasses as well as data and image processing via digital markers or multi-threaded video capture. There are two very important characteristics that will drive the effectiveness of an AR system. The first characteristic is how realistically does the system integrate virtual elements into the real world. The second, and probably more important characteristic, is how much does delivering the new content, service, or piece of relevant data at the exact right moment improve the end-user's experience, save them time, or in some other way improve their experience with an environment, product, or brand. Below you will find a list of different ways to execute augmented reality. Handheld - The first wave of commercial success for AR promises to be content or other solutions delivered via handheld displays including iPhones, iPads and other mobile and tablet devices. Head-Mounted Displays (HMD) - HMD's provide the most immersive AR experience with both real world elements and virtual graphics being placed directly over the user's view of the real world. Projection - Referred to as Spatial AR (SAR), digital projectors are used to display graphical information over real-life physical objects including the ability to display on multiple surfaces of a single setting. Surface – This most basic form of AR includes screens, doors, floors, walls and other surfaces that respond to touch to provide virtual real time information or data. Pattern – Simple pattern recognition of a shape or marker which is then replaced with an element that might include a 3D model, product data, audio, or video. Outline – Solutions based on outline might include the ability to pick up or manipulate a virtual 3D object based on the shape and movement of a users hand. Location – GPS or triangulated location along with the position or view of the device can be used to display elements or information in relation to real life objects. Hologram – Virtual or real items can be projected into a particular space with the ability to be interactive based on real world triggers including hand gestures and audio signals. Virtual Demo - Promote sales by allowing potential customers to virtually use, manipulate, and view products from all sides long with the ability to customize an order. Stores are able to display virtual items on the floor, or conversely, deliver in-home catalogue pop-up models to display products in 3D. Product Placement - Display products in a live environment. Examples here might include home staging where real estate agents are able to show an empty house full of furniture or try-on interfaces that allow users to see what they will look like wearing particular clothes and accessories. Personalized Shopping - Deliver personalized and targeted information to potential customers scanning shelves, stores, streets or other locations for discounted or personally relevant products. Branding Campaigns - Incentivize customers to scan outdoor areas to integrate topical, timely and relevant ads or branding content into a scene. 3D Viral Marketing - Develop promotions to inspire users to record scenes interacting with branded 3D viral content to be shared with friends. Social Games - Provide individuals the opportunity to interact with others through multi-player mixed reality games played in physical space. Utilities - Allow employees or customers to solve a particular problem or cross-reference timely information and data in real space. This might include underground mapping to provide views of non-visible elements like electrical lines, sewer pipes or underground transit systems, or provide access to notices, schedules, and alerts. Architecture - Use architectural previews to show yet-to-be-built buildings or pre-completed projects perfectly aligned with their surroundings. 3D Diagrams - For informational, tracking or training purposes, render internal views of complex objects with the ability to manipulate exploding views including labels which could be driven in real-time. Test Scenarios - Use a virtual hands-on interface to build and validate competency with complex equipment and difficult to practice scenarios like flight simulation, medical surgery, or bomb disarmament. Location Guides - Provide users a guide to a city, resort, theme park or other property or experience while offering tourist info, enhanced traveling data, special offers and even custom themed spaces. Educational Experiences - Provide deep levels of information and experience, even remotely, for settings like a museum, theme park, zoo, ancient site or exhibition. Event Tools - Provide an enhanced event application for users to scan for the latest information, achievements, attendee gossip or even video replays merged into a real scene. Collaboration - We are all familiar with video conferencing, but AR meetings have the ability to support multiple remote feeds to layer numerous colleagues into a single interactive environment. Translation - Produce dynamic subtitles and other data for a user in their particular language. Virtual Cast - Create television or film style story experiences where a participant is able to live an experience. Highly complex examples of this might include customized marker or location AR data combined with 3D viewing technology to deliver experiences that play out at ‘your’ location in real time. Facial Recognition - The use of facial recognition and related online data to push relevance content to consumers is the most foreword looking application of AR, and will be largely dependent on privacy laws as the market gains the ability to identify visitors in real-time. We are seeing a sharp increase in the number of augmented reality applications being released into the market, and it looks to be only the beginnings of an extremely fast growing industry. A new report from Juniper Research goes further to support this by indicating that while AR technology will only generate $2 million in revenue in 2012, revenues will jump to as much as $714 million by 2014 and over 5 billion by 2017. One important growth factor for AR seems to be the fact that these next generation apps are extremely accessible, being available to almost anyone with a smart phone, tablet, game console or computer. Another important growth factor seems to revolve around the fact that all open content across the internet has the ability to be used in AR applications. To learn more about how we are using our Augmented Reality project acceleration platform to help companies get to market faster, please visit our Augmented Reality Products page.